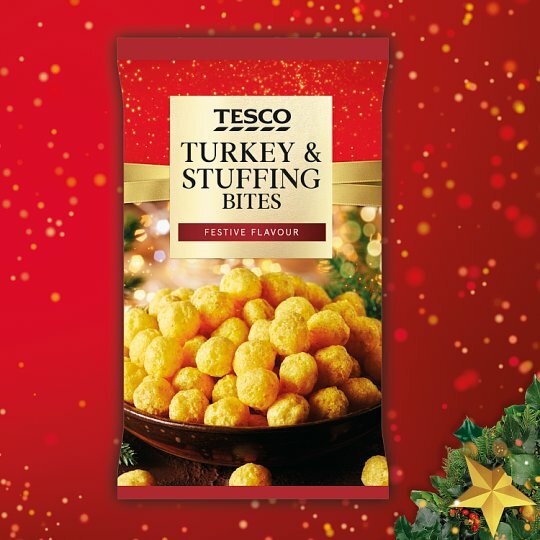 Turkey and stuffing flavour maize and potato snacks. Festive Flavour / Crunchy Turkey and stuffing flavour balls / Our snack experts started as a small, family owned business in 1956. Over the years they’ve perfected crisps and other traditional snacks. Today they draw on that heritage to evolve the classics, and create new snacks for you to enjoy. INGREDIENTS: Maize, Sunflower Oil, Whey Derivatives (Milk), Dried Potato, Sugar, Salt, Yeast Extract, Dried Onion, Buttermilk Powder (Milk), Flavouring, Garlic Powder, Citric Acid, Sage, Thyme, Colour (Paprika Extract).